Select: Steps OnlySteps with 4x5 pad (+ $70)Steps with White LED Light (+ $150)Steps with White LED Light and 4x5 pad (+ $220)Steps with Color LED Light (+ $200)Steps with Color LED Light and 4x5 pad (+ $270)Exterior Ladder Sold Separately This item is out of temporarily out of stock. Contact us for shipping date. Removable ballast keeps step in place. Allows for easy winter put away w/out sandbags. Sold Separately – Outside ladder for non deck applications. Sold Separately –Mood light in white or new LED options can be place on front of step. 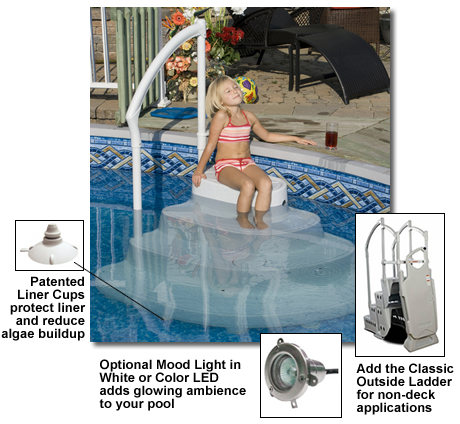 Measures 58”wide x 44” deep x 43 ½: high to fit any above ground pool 48”-54” deep.